HOUSE NEWS: Midsummer update and bake sale this weekend! Just wanted to give y’all a quick mid-sumer update and also invite you to a bake sale going on this weekend in support of the GCW! 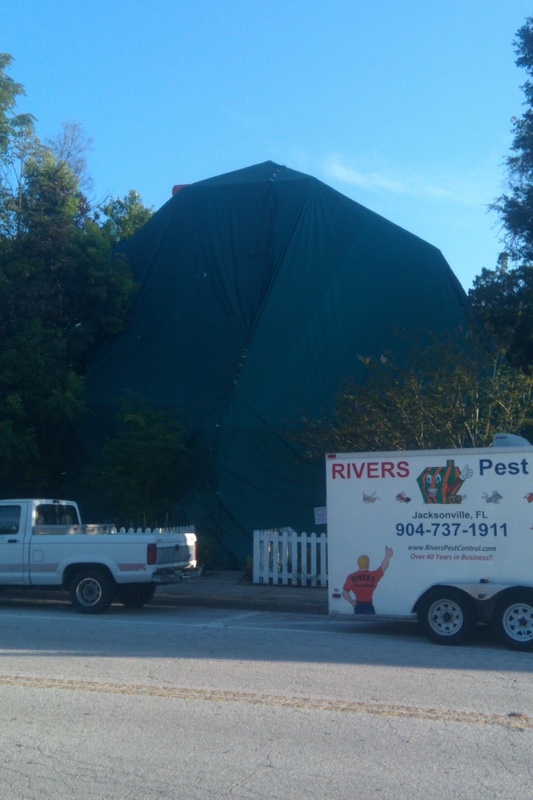 TERMITE TENTING: As you can see from the photo above, the house was engulfed by a huge green tent for two days, thoroughly fumigated, and cleared for re-entry the week of July 9th. Many thanks to everyone who helped make it happen, including Gloria and Dave for putting me and Rudy up for 3 days and Jade and Lynn for letting us store some food in their freezer. We raised enough money to cover the fumigation with some great help from a number of individuals and a contribution from the Knights of Columbus at Holy Faith Catholic Church. Thanks all! BAKE SALE AT ST. AUGUSTINE CHURCH THIS WEEKEND: If you’re a parishioner at St. Augustine Catholic Church and Student Center, or if you know someone who is, or even if you’re just in the neighborhood passing by–Mary Peer, GCW volunteer extraordinaire, has organized a bake sale in support of the GCW after Masses this weekend (July 28-29). So bring a couple extra dollars and purchase some homemade baked goodies (I can vouch for Mary’s baking!) after Mass on Saturday evening, Sunday morning and Sunday evening. Mary will also have some items left from the Art for All sale this past Spring in case you’d like to check that out too. Many thanks to Mary! 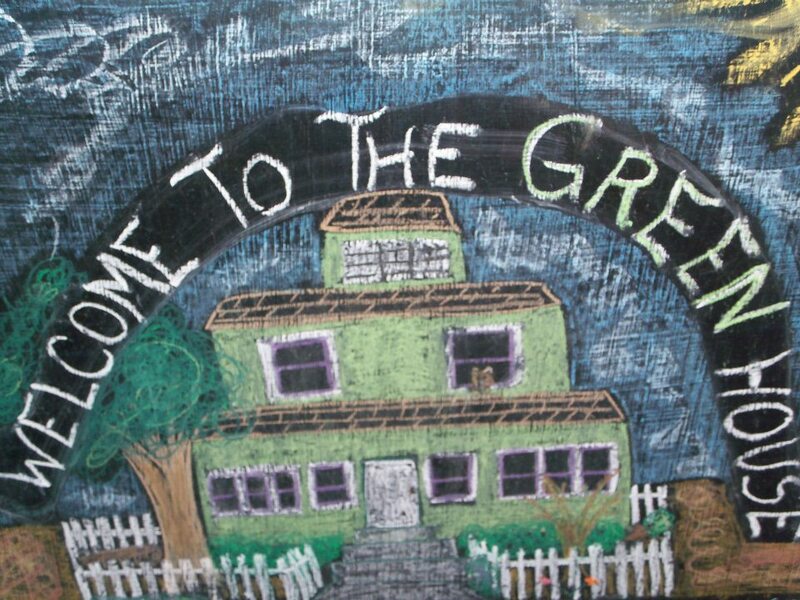 FALL SEMESTER AROUND THE CORNER: Our fall community members will start to move into the Green House beginning this weekend (yay Gloria and Clayton!) and we should have a full house (8 community members for the fall) by August 20. We’ll be getting things ready around the house, setting a new schedule, and making other preparations beginning August 1. We’ll start some things up the week of August 19th, with everything up and running the week after. Let us know if you’re interested in a regular volunteer gig with us this fall. We would love to have you! Now that we’re a few weeks into our summer sabbatical, I thought I’d share a short review of this past year. So many people are involved in keeping the Green House open and flourishing–each year we have a core of about 50 volunteers that function as “regulars”, showing up several times a month, every week or even multiple times each week; plus we have another group of folks that is easily double that number who drop in at least once-a-semester or several times over the course of the year to lend their help. We are so incredibly thankful for each of you who find the time to grace our community with your skill, your dedication, your wisdom and your time. You are the reason we thrive. and week-in and week-out we opened our doors for people to get out of the cold, enjoy a cup of coffee, receive mail, use the bathroom, get a blanket or some clothing, share our evening meal, join in prayer and reflection, study and learn together, and so on. Mainly, what we did this past year–what we actually do every year–is this: we walked together with one another, helping each other along the way, sharing what we have and who we are, and trying to truly be family to one another, as the best of our religious and spiritual traditions call us to. To everyone who has walked along the way with us this past year, we say thank you. And we hope you’ll join us again, mingling your life with ours, when we start back up in early August. Until then, we hope you have a blessed, peaceful and joyful summer.